The folks in the Summoning Office are always hard at work, drawing into this world various creatures that can aid us with a few necessary ingredients for costumes or even go into the world to enact any variety of strange tasks. They are the inspiration for many of our best ideas! But, the thing about conjuring up monsters to help around the office is that the conjuring is always just a little unpredictable. They’re usually well behaved, but some of them aren’t always perfectly suited for the tasks at hand. This time around, we called up a few to help with customer service support. We thought, ’Hey, we need a few monsters who are cheerful, creative… and probably colorful. Gotta have the three Cs!’ It was a great idea at the start, but we weren’t quite expecting these adorable monsters to burst onto the scene. They’re near perfect, but not only do they have trouble reaching the phones, but they tend to giggle and play goofy practical jokes that, while great fun, aren’t helping the customers. We don’t have video phones, so they only get half the joke! 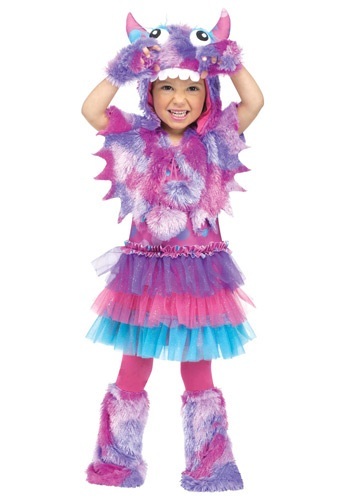 So, here is your chance to transform your toddler into a Polka Dot Monster with this perfect costume. No need to be afraid if you’re bothered by monsters and these ones are pretty light on fur, so you probably won’t even be allergic! The pink-to-purple dress has glorious polka dots of blue and dark purple throughout and feature a three-shaded tulle tutu that makes for the perfect match. Furry hoodies and matching foot covers and mitts reveal the monstrous tendencies of the little devils, so you’ll be prepared for a few pranks. No vicious teeth or claws on these darlings. Just bright grins and brighter colors. This costume is adorable! However, it falls apart so easily. The “fuzzy” comes off like crazy, the cape and leg warmers came completely apart and the hat is EXTREMELY small! If you are buying this for just a couple hours it will work, but don’t buy this costume to get many uses out of. So sad, because like I said it is the cutest on and we got lots of compliments!